Something wasn't quite right. For a few months, he'd been complaining of stomach aches, staring at me through discouraged eyes as he pushed away from the dinner table. My four-year-old was nearly same height and weight he was as a three-year-old, with skinny limbs and an enlarged stomach, like the malnourished children one sees on child sponsorship commercials. His preschool teachers had noticed how lethargic he acted, yawning almost constantly and lacking the vibrant energy of most preschoolers. As parents, we were concerned, and took him to see the doctor to be tested for celiac disease, a gluten-related condition. The blood test came back negative, leaving us with little answers (apparently, a false negative can frequently occur, and the only way to know for sure is through an intentestinal biopsy). But my tenacious wife decided to try a gluten-free diet for a few weeks, just to see if it made any difference. We changed his diet--already limited by egg and dairy allergies--and waited. Only a few weeks later, we have a vibrantly growing little boy. His energy has returned, he never complains of stomach aches, the distended stomach has disappeared, and he eats second (and third!) helpings at dinner. Whether or not he is officially diagnosed with celiac disease, the change in his diet has changed his whole demeanor and growth. The thing is, he loves wheat. Crackers, sandwiches, bagels, cereal--removing gluten from his life was not an easy task. It required discipline and intentionality for our entire family. But the change has made him feel so much better, so much more alive. It reminds me of my own dietary restrictions due to allergies. I've had a peanut and legume allergy since I was a child, but only a few years ago I was diagnosed with an extensive list of new allergies that had suddenly appeared--allergies to nuts, seeds, even foods like carrots and celery. Yes, celery. It's about the equivalent of a water allergy. I had to dramatically change my diet to the point where I never eat fast food and can only rarely eat out, nearly all my meals are homemade from scratch, and I eat very simple (read: boring) meals. It required discipline and intentionality too, but the change has made all the difference. What about my spiritual life? I imagine there are activities, habits, and even relationships that are part of my routine intake, but are actually doing more harm than good. The amount of time I'm on a phone or the Internet. The relationship with a constantly draining person. The knee-jerk reaction of insecurity or anger when criticism arises. The lack of time to read good books, pray in silence, or be alone with the Lord due to an overly busy schedule of doing good things for the Lord. There are all sorts of things I frequently indulge in, yet typically lead away from the abundant life Jesus offers. What am I consuming that may seem to be substantial, but is causing spiritual malnourishment? Like gluten for my son or celery for me, there may be some facets of life that *appear* to be healthy and normal, but are actually slowly causing lethargy and weakness in my relationship with Jesus, spiritual "allergies" that are breaking down health in my system. Seeking spiritual health requires discipline and intentionality, identifying the unhealthy practices and relationships, and replacing them with a simple, life-giving diet of spiritual disciplines and gracious community. 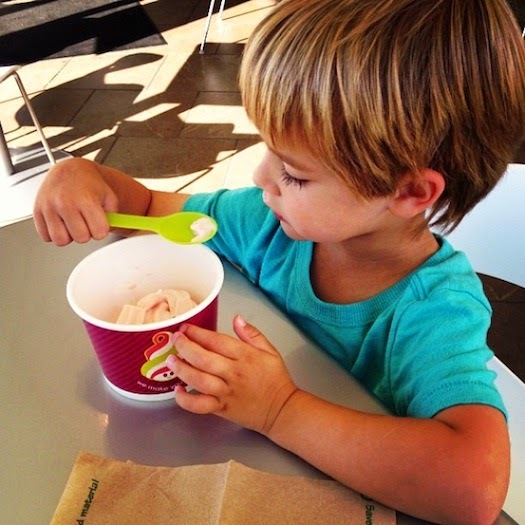 Copeland eating at Menchie's, the closest local fro-yo. "The Scriptures say, ‘People do not live by bread alone, but by every word that comes from the mouth of God.'" (Matthew 4:4). Fro-yo is pretty good, too. But a steady diet of listening for God's voice will lead to a more whole, full life. What needs to change in your own diet? What habits, situations, or relationships do you need to remove from your life in order to seek health?